There are varying merits to eating lamb at different times of the year. Young spring lamb is deliciously tender but later in the year autumnal lamb is much more flavoursome as it’s had more time to develop. It’s at this time of year that I particularly like to slowly roast a leg or shoulder of lamb. I was recently sent some organic Welsh lamb steak to try, as it’s in season right now, from the Rhug Estate in the in the Berwyn Mountains of North Wales. I cooked it over a high heat until it was lovely and pink and cooked up some butter beans and tomatoes to go with it. Rob exclaimed that it was some of the tastiest lamb he had ever tasted and I have to concur. To find out more about Welsh lamb take a look at the official website www.eatwelshlamb.co.uk. Take the lamb steaks out of the fridge and allow them to come up to room temperature. Gently heat a little olive oil in a medium pan and add a crushed garlic clove and a few sprigs of rosemary (kept whole). Sauté them for a minute or so until you start to smell the incredible aromas and then add the butter beans, chopped tomatoes and a pinch of cumin. Bring the mixture to the boil and then simmer it for about 10 minutes, until it thickens up, then remove the rosemary sprigs. In the meantime, heat a griddle pan or non-stick frying pan over a high heat. Rub the lamb steaks with olive oil and season them well with salt and pepper. Add the steaks to the pan and cook them for about 3 minutes on each side so that they’re nicely browned on the outside and a little pink in the middle. 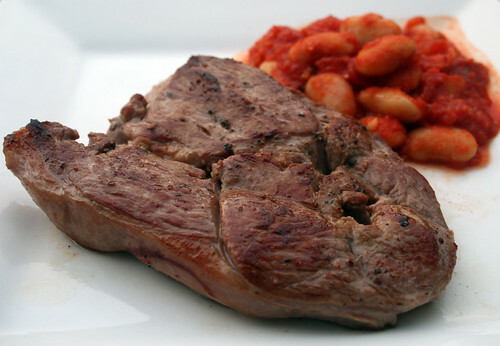 Serve the lamb with the butter beans and tomatoes. Tell me; what’s your favourite way of cooking lamb? I love lamb and had no idea that it was most flavorful during the fall! I like that this recipe is so simple.. Thanks for sharing! I think I prefer lamb at this time of year actually – it has much more flavour though it is true that lamb is wonderfully tender in the spring. The butter beans and tomatoes would be delicious alongside. I often do lamb steaks for supper with a speedy roasted ratatouille on the side – roasted courgettes, peppers, red onions, garlic cloves and cherry tomatoes. I love lamb with Moroccan spices too and often smear harissa over lamb steaks and serve with couscous. and it definitely maximises the lovely autumnal flavours of the later lamb. The herbs highlight rather than cover the lamb’s own flavour. The sweetness of lamb also really works with all the autumn flavours around at the moment.